Your body consists of fat and all the rest: its fat-free components. If you are overweight, improving your body composition involves lowering your percentage of body fat. Increasing lean muscle tissue and reducing your stored body fat helps lower your percentage of body fat, and compound exercises have the ability to improve your body composition. Unlike isolation exercises, which only require a single joint movement, compound movements maximize muscle activation with multiple joint articulations. Compound upper-body pushing exercises help improve your body composition by incorporating shoulder blade, elbow and shoulder joint movements. Upper-body pushing exercises that apply horizontal resistance target your pectorals, triceps, serratus and lateral deltoids. 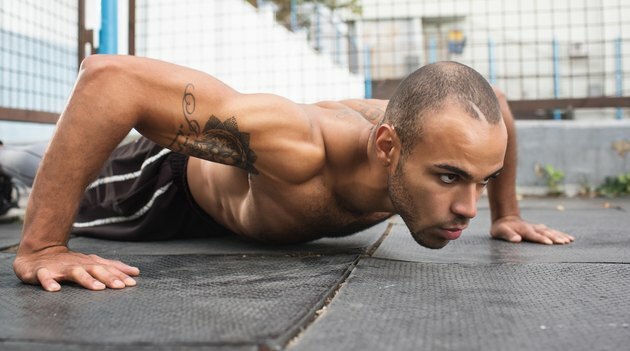 Pushups and weighted variations of the bench press, including the flat, incline and decline press, are examples of horizontally loaded upper-body pushing composition exercises. Vertically loaded upper-body pushing exercises, such as the military press and shoulder press, work your anterior deltoids, upper pectorals and trapezius muscles. Composition exercises that involve upper-body pulling movements activate your biceps, deltoids and multiple muscles in your back. Joint movements that contribute to upper-body pulling exercises include transverse adduction of the shoulder blades, elbow flexion and extension of the shoulder joints. Horizontally loaded upper-body pulling composition exercises include seated rows, dumbbell rows, T-bar rows and bent-over rows. Vertically loaded upper-body pulling exercises that help improve your body composition include chinups, pullups and lat pulldowns. Exercises can also involve lower-body pushing. These activate your quadriceps, gluteal muscles, lower back and calf muscles by combining knee extension, ankle flexion and hip extension movements. Bilateral lower-body pushing exercises simultaneously work both legs with each repetition. Variations of the squat and leg press are examples of bilateral lower-body pushing composition exercises. Unilateral lower-body pushing exercises work each leg with alternating repetitions. Unilateral pushing exercises include lunges, step-ups and split squats. Lower-body pulling exercises that help improve your body composition activate your gluteal and hamstring muscles by combining hip extension and knee flexion movements. Hip extension movements that include involve knee flexion, and place your hamstrings in a stretched position are among the best exercises for hamstring development. Kneeling hip extensions and variations of the glute-ham raise are examples of lower-body pulling exercises for body composition. Rolling, sliding, and gliding leg curls also extend your hips and flex your knees.